Fly above the beaches of the Perth area and the historical port city of Fremantle on a 30-minute helicopter tour. As you soar above the Western Australian shoreline, look down on the busy waterfront, where the Swan River meets the Indian Ocean, and spot white-sand beaches against the turquoise water as you fly past sights like Observation City. You are required to select your desired departure time range when submitting your booking request. This is an indication only. Upon your booking being confirmed (subject to availability), you will be advised of the exact departure time. If your preferred time range is not available, your booking may be confirmed for the next available time. Your air tour by comfortable jet helicopter starts as your rise up into the air and take off along 15 miles (25 km) of Western Australia’s coastline. 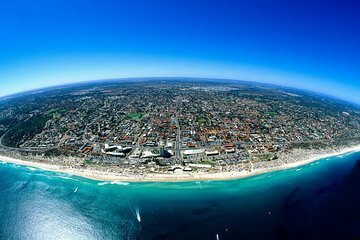 Soar above popular surf beaches of the Perth area, look down on the white sands of City Beach and Cottesloe, and cross over the basin of the Swan River, which dumps into the Indian Ocean. Enjoy aerial views of Fremantle, a historical port city just across the river from Perth, popular for its lively cafe scene, restaurant-lined waterfront and heritage buildings. You’ll also see coastal sights like Hillary's Boat Harbour. Confirmation of your travel date will be received at time of booking Please include your preferred flight time along with each individual passenger's weight at the time of booking. The closest available time will be allocated. You must call the local operator 24-48 hours prior to travel to reconfirm the exact departure details. All contact details will be advised upon confirmation. All passenger weights MUST be advised at time of booking. Should you advise a weight variance of more than 10%, the right is reserved to charge a 100% cancellation fee. Note combined weight may not exceed 320kg.